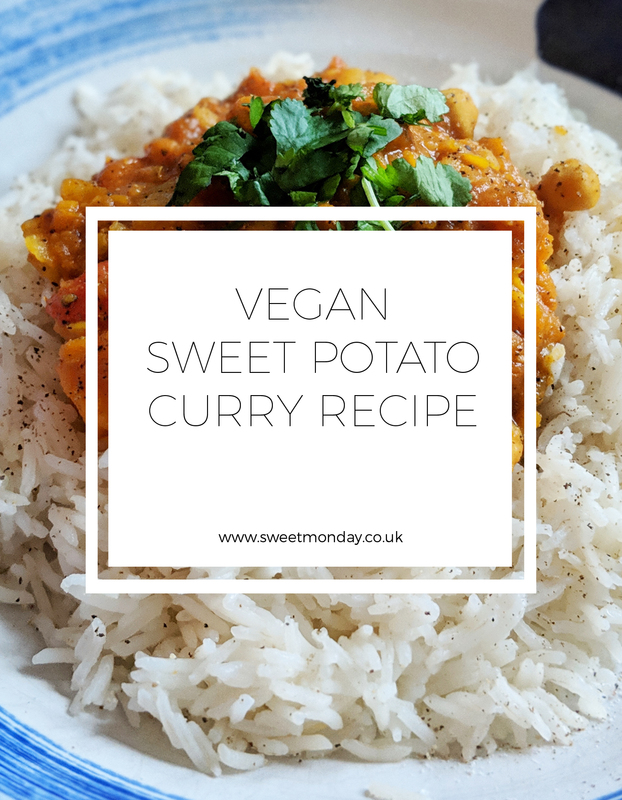 It might look like a long list of ingredients but this tasty sweet potato, chickpea and lentil curry is super easy to make! Whilst spices can be expensive, they’re a fantastic investment. If you’re into cooking already, or are enthusiastic to start broadening your recipes, you will need spices… And they most definitely won’t sit in the back of the cupboard for years on end, like my Mum’s do! We add herbs and spices to every dish we make, and you can really experiment with your food by doing so. 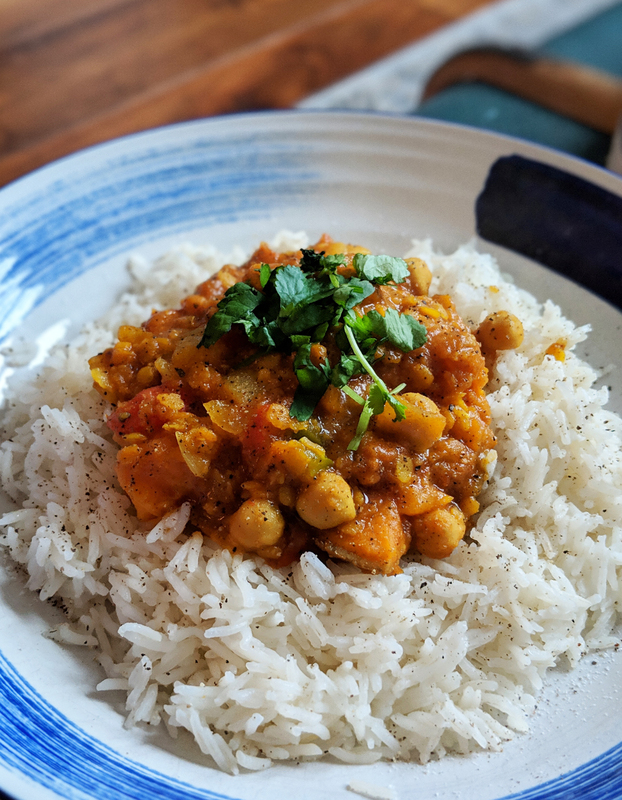 This vegan curry recipe is a great way to begin adding spices to your collection, and the basis of this curry will help you learn and form the base to any future curry you make. 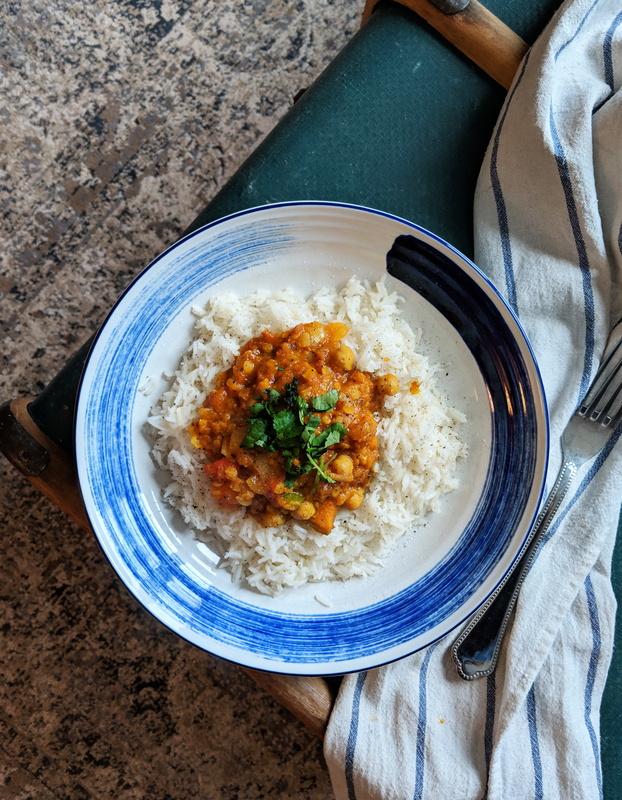 In fact, we very often switch up the other ingredients in this curry – using cauliflower or butternut squash instead – but always stick to the same spice mix to form our curry paste. I’m very proud of this recipe as it was our first full experimental dish and it tasted amazing. 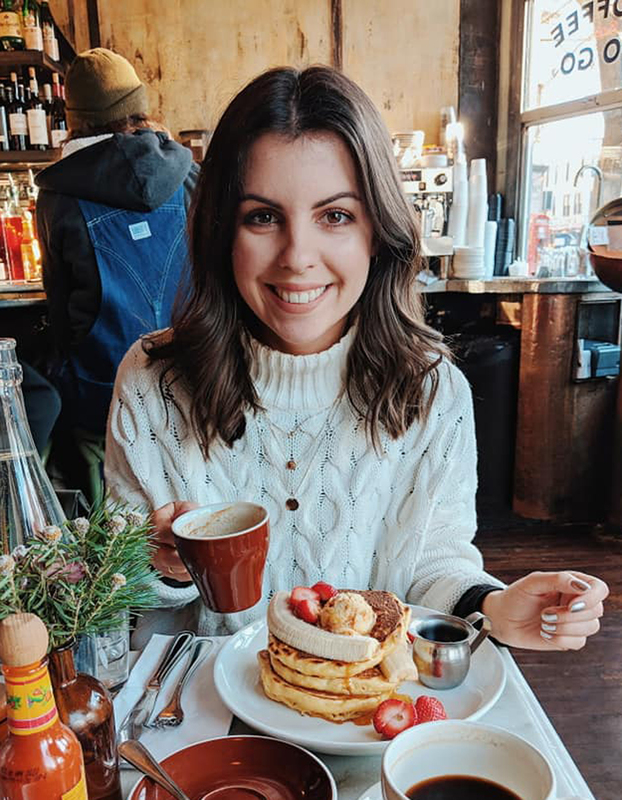 We’ve since made it for lots of our friends and family, and I hope it’s also helped open their minds to vegan food. Indian curries, in particular, do not necessarily need meat. In fact, a lot of Indian food is naturally vegan and it’s packed full of flavour, texture and colour. We also tend to make this dish in HUGE quantities, because it’s just a lot easier to throw everything in one huge pan and cook it down. Plus, batch cooking is much more cost effective. Begin by preheating your oven to 200 degrees. Transfer the sweet potato to an ovenproof dish, season with salt and pepper and a drizzle of oil. Roast for 15 – 20 minutes. Meanwhile, heat 4tbsp of oil in a large pan over a medium heat. Add the onions and cook for 3-5 minutes. Add the garlic, chilli and ginger, cook for a further 2-3 minutes. Mix in the peppers, lentils and chickpeas. Stir in the ground coriander, cumin, garam masala and turmeric. Remove the sweet potato from the oven and add this to your pan. Stir everything together, ensuring the spices are well mixed. Pour in the stock and chopped tomatoes. Stir again and simmer on a low heat, with the saucepan lid on, for around 15-20 minutes. Add the mushrooms and simmer for a further 15-20 minutes, with the lid off. Stir in two thirds of the fresh coriander, adding salt and pepper if desired. Serve with basmati rice and a sprinkling of the remaining coriander. (You could add some chilli flakes if you want more heat).